There are many ways to plot a novel. No one way is right. Some people have great success planning their novels as they write. If you already have a process that works: Hooray! I'm always changing my planning. At one point I thought I was searching for the perfect planning technique, but now I think I'm simply changing my process to fit who I am today--and what I'm writing today. For me, the important thing is that I keep a spirit of playfulness in my planning. Writing is fun! It may be that you take a look at a bunch of different ideas and mix things up for yourself. If so, also: Hooray! I'm only including the basic steps here. If you'd like more information, please do watch the video. It's about ten minutes long and I go into a lot more detail. Need more background about clustering? Check out the blog post I did about clustering as a process of discovery. 1. 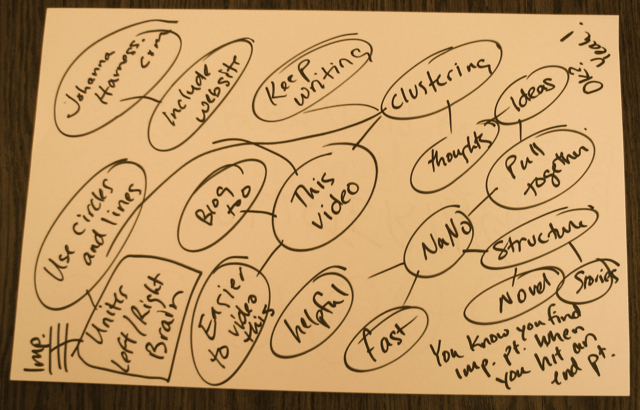 Best thing w/ clustering: If you cluster by hand, creates a left-brain/right-brain buzz. Must use circles, lines, words. 2. Don't pause until you must--then recognize the insight/question that made you pause. Fascinating to me that this works. A bit of magic. 3. 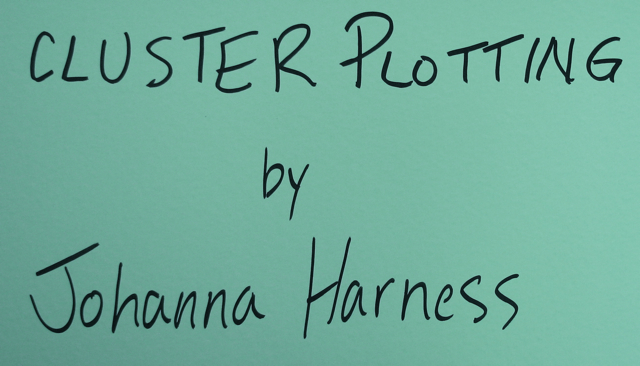 Do the plot through-line first. Central question to satisfying ending. Just a bubble for key steps. 4. 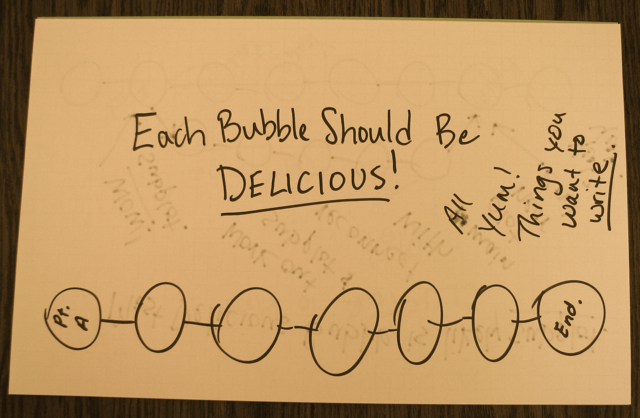 Each bubble should be delicious. You don't have to give it all away in outline. Just know where you want to lose yourself. 5. 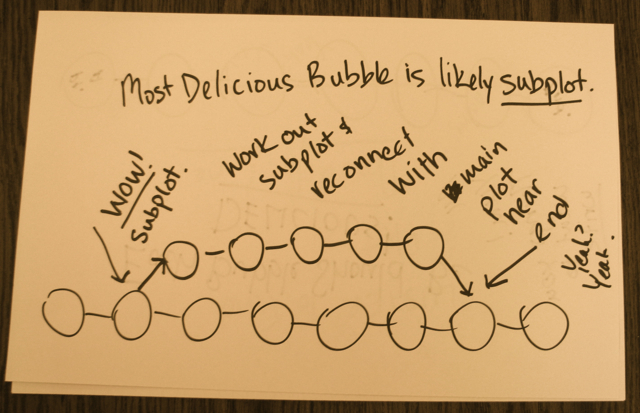 When you see the really delicious bubble, it's probably a subplot. Follow it in parallel to through-line. 6. See if you can make that subplot reconnect to a through-line bubble near the end (but not at the end). 7. Then move to arc. Identify bubble where everything changes in book. This is midpoint. Connect that to the word count goal for your novel. 8. Set-up should be done early. Which bubble is that? 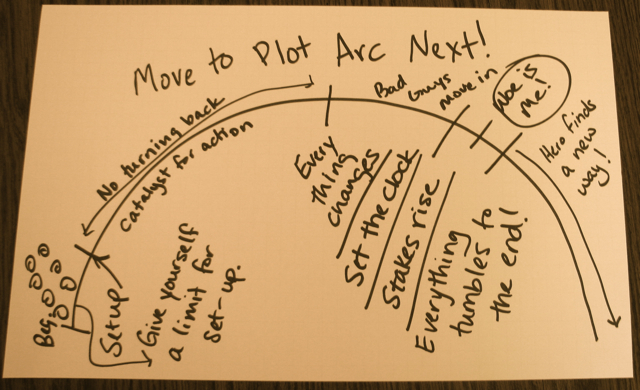 Put it on your plot arc. 9. Btwn set-up & midpt: Catalyst for action, debate, subplot introduced, no turning back. 10. At midpoint, the clock is set and the stakes rise. There is a force pushing you toward the end of the book. 11. From midpt to next 1/3 of downward arc: bad guys close in. At the end of this section, it appears all is lost. 12. Next short section is dark night of soul (should be abt 3/4 through book by end). 13. Final 1/4 of book: hero finds a new way home. There can be false ending followed by rise of bad guy, & a 2nd triumph. 14. Don't worry about fleshing out every scene for NaNo. You can do that in rewrites. 15. The best part abt assigning word count is pacing. I always write long, so a limit makes me focus on the best parts. 16. Once I have the structure, I can look at how much time passes, what day it is, day or night, etc. 17. I can also examine character location. 18. And I can plan all this without taking away the spark & fun of writing. I don't know the details, only that I need to get from Pt A to Pt B. Need more? Here's the video. Enjoy!